A bit belatedly, the production notes for Star Wars: Knight Errant - Deluge #3 are now online — thought the notes for Mass Effect: Invasion #1, which came out on the same day, remain on my to-do list, along with some of the Evolution issues. On the heels of the last couple of announcements about January's Star Wars: Knights of the Old Republic: War series, Dark Horse for its Star Wars Friday has released art including page one of the series, with dialogue. Of interest to many will be the new version of Republic frigate which appears in the first panel by artist Andrea Mutti. As we see in Andrea's drawing on the Dark Horse site — which is canonical — there are actually two "assault decks," above the central axis of the ship for aerial vehicles, and below, where we see one of the doors opening. We'll learn more about the specific ship we see on panel — which, KOTOR buffs, already exists in the series history — when the issue comes out. Be sure to order Star Wars: Knights of the Old Republic - War #1 from your retailer when it appears in the November catalog! KOTOR WAR, Knight Errant, Mass Effect release news! Comic Book Resources has the January 2012 Dark Horse solicitations, so you can see the spiffy variant cover that Dave Wilkins has done for Star Wars: Knights of the Old Republic: War #1! As noted last week, art is by Andrea Mutti, Gigi Baldassini, and Michael Atiyeh, with covers by Wilkins and Benjamin Carré. It's on sale Jan. 11 — and as the solicitation announces, it is in the same miniseries format as most of the other recent Dark Horse Star Wars titles. As the solicitation says, "If you’ve ever heard of the Knights of the Old Republic video games and comics but didn’t know where to start—this is it!" And Wednesday is a double-comics day for me. Mass Effect: Invasion, which I both coplotted and scripted, launches with #1 and two variant covers; and Star Wars: Knight Errant: Deluge sees its third issue go on sale. Be sure to check them out! Knight Errant: Escape starts in June 2012! 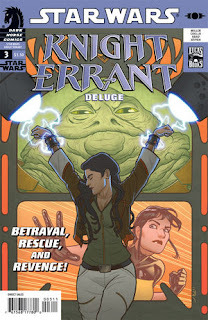 "Star Wars: Knight Errant – Escape will launch in June 2012 for a 5-issue arc. Fan favorite John Jackson Miller is writing the series, with artwork from penciller, Marco Castiello, inking by Vincenzo Acunzo, colors by Michael Atiyeh and lettering by Michael Heisler..."
Don't forget, Knight Errant — Deluge #3 goes on sale on Wednesday. That's also when Mass Effect: Invasion #1 launches as well. Double JJM Wednesdays return! 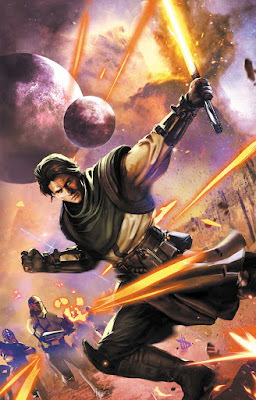 Zayne Carrick returns in Knights of the Old Republic - War! 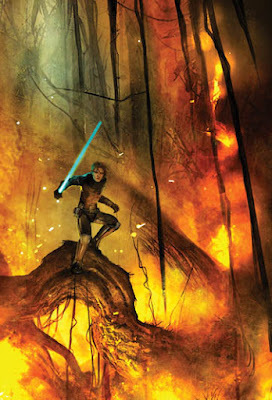 At Dark Horse's retailer breakfast this morning at New York Comic Con, the publisher announced the next installment in the life of Knights of the Old Republic hero, young Zayne Carrick. Written by yours truly, Star Wars: Knights of the Old Republic: War begins in January! The Jan. 11, 2012 release date is almost six years after the publication of Star Wars: Knights of the Old Republic #1 — but it's set not long after the end of Knights of the Old Republic #50, and Zayne's peace and quiet following that series is short-lived. He's not a Jedi and the Mandalorians are invading — and with his homeworld of Phaeda under threat, Zayne's luck holds true. He gets drafted! Troubles ahead for our peace-loving hero — and surprises galore in this story, including the return of some familiar faces. With cover art by KOTOR favorite Benjamin Carré and a variant cover by Dave Wilkins, Knights of the Old Republic—War "doesn’t just mark the return of one of the most popular eras in Star Wars video games and comics," Dark Horse says, "it is an entry point for any reader interested in Star Wars!" It really is a true jumping-on point. If you haven't read any KOTOR comics at all — or if you're a regular who's read everything — you'll find a lot to like. (Don't forget, there are nine KOTOR trade collections still in print — and many are available from Dark Horse digitally.) Art is from Italian artist Andrea Mutti, who drew Rage for Dark Horse. Much of the rest of the team returns, including editor Dave Marshall, colorist Michael Atiyeh, and letterer Michael Heisler. I continue working in Kerra Holt's time frame — Knight Errant Deluge #3 releases next week, and there's more to come — Dark Horse also announced the next round of Knight Errant comics for 2012! I'll let you know when I can share more details about that story — it's a blockbuster! Star Wars: Knights of the Old Republic: War #1 is in the retail catalog in November for January shipping— order it at your local comics shop!